Teeth frequently crack when they make contact with hard objects, especially when they are weakened by decay. If you discover that you have chipped a tooth, there is no need to be alarmed; an experienced cosmetic and restorative dentist like Dr. Robert Rioseco can use a variety of methods to make strong repairs that look natural. It is important to contact a dentist promptly when you notice part of your tooth is missing—allowing the tooth to remain untreated can leave it vulnerable to developing severe problems that may be more painful and costly, as well as time consuming to fix. Direct bonding is a method typically used for small chips and other minor damage. During the bonding process, color-matched composite resin (the same material used for tooth-colored fillings) is layered and molded to complete the original tooth shape. While direct bonding can be performed quickly with cosmetically satisfying results, this technique is a less expensive alternative to ceramic options and is not intended as a permanent means of tooth restoration. Ceramic restorations like those mentioned below are more durable and can generally maintain higher quality aesthetics for a longer period of time. Porcelain veneers can be an ideal solution for repairing chipped teeth that are visible when you smile. A porcelain veneer is a thin shell of ceramic material designed to cover the entire front portion of the damaged tooth and make it look whole again. The aesthetics of high-quality porcelain veneers closely mimic the appearance of natural tooth material. Dr. Rioseco can precisely match the color to blend with the surrounding teeth, which provides beautiful, consistent results. Lastly, porcelain veneers are durable and stain-resistant so they can maintain their strength and appearance for years—and in some cases decades—with proper care. Porcelain crowns are typically recommended when a tooth is badly broken or severely decayed. A porcelain crown is essentially a high-quality ceramic cap that fits over the body of a damaged tooth to restore its full structure, strength, function, and appearance. Prior to placement of the dental crown, Dr. Rioseco must prepare the tooth, which involves removing all decay (if necessary) and reshaping the tooth body to best accommodate the crown. As a convenience to patients, Dr. Rioseco can use his state-of-the-art CEREC® machine to custom design and fabricate crowns during the span of one appointment, rather than two. 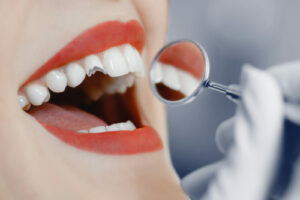 Crowns are cemented firmly in place and with proper care, they can last for decades. If you have a chipped or otherwise damaged tooth, we encourage you to contact The Center for Cosmetic Dentistry to schedule an appointment with Dr. Rioseco. He can examine the tooth and explain which dental treatments are most in line with your needs, priorities, and aesthetic goals.